Cameron seemed to have a busier social calendar than his parents this week! Besides working and playing with his favorite Anne and Grandma, he also had a visit to Ken-o-Sha Preschool! When he does attend preschool, this is where he'll go, so it was good for Chris and Jane to have a quick tour of the place with Cam- many thanks to Julie for showing us around! The big boy was able to spend 2 days with his Grandma this week and had lots of fun. Jane took some time away from work on Friday afternoon to spend some quality time with Cam and Grandma at Ada Park! 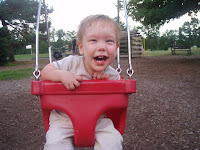 The weather has been so nice and Cameron really like the swings. The weekend included lots of outdoor time for Cam and a date night for Chris & Jane on Friday (thanks Andrea & Zach!) eve to catch dinner and a movie. A perfect end to the week was having pizza night with our great neighbors- the Raisch family. With 4 girls in their family, Cam can't give enough smiles or blow enough kisses...Chris & Jane already know he's quite the little flirt!